Doodles are usually drawn in the margins of a notebook, scribbled on ephemeral scraps of paper. But what happens when a doodle comes to life and refuses to be erased or discarded? 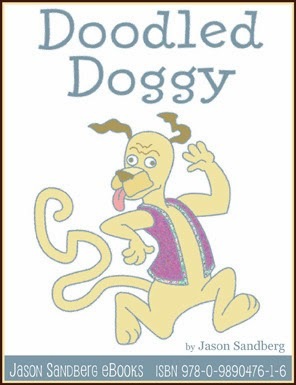 Doodled Doggy is a lighthearted adventure for the young at heart! Click here to buy Doodled Doggy. I've been a fan of Jason Sandberg's for a while now, having read and loved his previous books: Candy and the Cankersaur and The New Crown. (Click the titles to read my reviews). What makes Sandberg's books special is the fact that they are so whimsical. Reading his books makes me feel like a kid again. Sandberg's books remind me of the types of books I read as a child, and I love the concept of a new author creating, as he puts it: "the missing books from my childhood, the books I wished I'd had." I agree with Sandberg, and love the fact that I can enjoy these books with my two-year old. There's nothing better (for me at least) than snuggling up to my little girl and reading to her. And, of course, the better the book, the better our reading experience is. What sets Jason Sandberg's books apart for me are the beautiful hand-drawn illustrations and the simple yet attention-grabbing text. His books are fun to read, and fun to just look at. I always read his books with a smile on my face---I love it when picture books make me smile! If you have a child who loves picture books, or you're an adult who loves children's literature (absolutely NOTHING wrong with that, by the way), I would highly recommend Jason Sandberg's work!